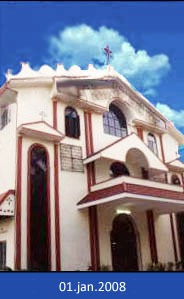 The church is equipped with a parish hall and a spacious pandhal with a seating capacity of 500. Tables and chairs are provided at an extra cost. Ample parking facility avaialable. Stage decorations are also provided on request. The church choir will be available on request for all ceremonies being held in the church. The cemetery with a chapel named after St. Gregorious is located at Nilampadinjamugal near Kakkanad.